Gov. 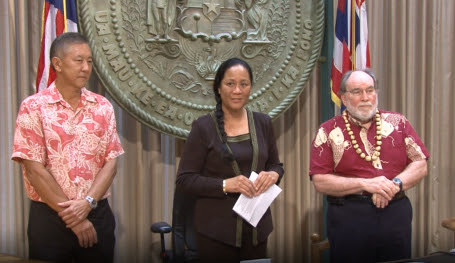 Neil Abercrombie packed his ceremonial room today with a rare combination of leaders from the Legislature, HECO, environmental nonprofits and union groups who all support his signing of a progressive new energy policy. The so-called "green infrastructure" bill is aimed at helping low-income homeowners, renters and nonprofits take advantage of renewable energy technology. As Richard Lim, the head of Hawaii’s Department of Business, Economic Development and Tourism, put it: "We want to promote the democratization of green energy." Public Utilities Commission Chair Mina Morita underscored the importance of Senate Bill of 1087 for thousands of people in Hawaii who struggle to pay the nation's highest electric rates but can’t afford solar panels for their homes. The bill will help more people take advantage of renewable energy technology through a new on-bill financing program and low-cost loans. Blue Planet CEO Jeff Mikulina called it a “game-changing policy that will help bring the benefits of clean energy to folks who need it the most."